Bangalore Literature Festival (BLF), Bengaluru city’s flagship literary event, is all set for a spectacular 2018 seventh edition on October 27th and 28th at the breezy green lawns of Hotel LaLiT Ashok in Kumara Krupa High Grounds, Bengaluru. Are Women Stories Only for Women? Genes & Destiny: Are We Doomed to Be? Is There an Indian Road to Equality? The two-day event will feature a host of distinguished speakers, authors and artistes including Ramachandra Guha, Shashi Tharoor, William Dalrymple, Aatish Taseer, Girish Karnad, Farzana Shaikh, James Crabtree, Ashwin Sanghi, Easterine Kire, Carl Malamud, Amitabha Bagchi, Pavan K Varma, Shobhaa De, S Hussain Zaidi, Shashi Deshpande, Francois Gautier, Ranjit Hoskote, N. Ponnappa, Naina Lal Kidwai, Arundhati Nag, Pratik Sinha, Shweta Bachchan-Nanda, Sister Jesme, Sarika, Anand Teltumbde, Sandhya Menon, Prasenjit Basu and many others. Along with senior journalists Bachi Karkaria, Barkha Dutt, Chidanand Rajghatta, Nilanjan Mukhopadhyay, Mukund Padmanabhan, Max Rodenbeck, Neena Gopal, R. Sukumar, Sandeep Unnithan, Naresh Fernandes, Chitra Subramaniam, Ravi Shankar Etteth, Alex Travelli, Sreenivasan Jain and Saba Naqvi. Bhasha writers include Bolwar Mahamad Kunhi, AR Venkatachalapathy, K R Meera, Geetanjali Shree, Velcheru Narayana Rao, Vasudhendra, Nalini Jameela, Nagesh Hedge, Prathibha Nandakumar and Benyamin. International authors Alyssa Ayres, Robert Dessaix, Athol Williams, Deirdre Jonklaas Cadiramen and top names in publishing like VK Karthika, Renuka Chatterjee, Shantanu Ray Chaudhuri will be at LitMart – the pitch session for aspiring authors. Voices from young India are Manu Pillai, Janice Pariat, Appupen, Preeti Shenoy, Prayaag Akbar, Snigdha Poonam, Amitabha Bagchi, Shubhangi Swarup, Rajith Savanadasa, Roanna Gonsalves, Samit Basu and Krishna Udayasankar. 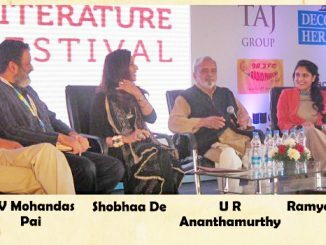 The Bangalore Literature Festival (BLF) remains among the most sought after and must-attend event for readers and writers from Bangalore, India and the world, with its stimulating panel discussions, interviews and literary sessions. As in the past, this year too the Festival will witness authors engaging the audiences with diverse themes. Highlights include “The Indian Road to Equality”, “Love and Longing in Hindustan”, #MeToo Comes to Town, “Telling a Story, Shaping the World”, “Editor’s Cut: Road to 2019”, “Ode to Southern Poets”, Looking Beyond 377 “Outside Looking In: Eyes on India”, “Questioning the Foundations of the Indian Republic”, “Crossing to Hampi: A Dramatic Exploration of the Vijayanagara Catastrophe” along with conversations on fashion, fake news, feminism, crime, political cartooning, popular science, wildlife, graphic novels, literary fiction, narrative non-fiction, memoirs, poetry and a lot more. Tomorrow Now: Envisioning the Next Fifty Years with Bruce Sterling – Science fiction writer, net critic, and internationally recognized cyberspace theorist known for his novels that defined the cyberpunk genre. Agatha Christie, Poirot and Me with Sophie Hannah – Internationally bestselling writer of psychological crime fiction and who writes new Hercule Poirot novels with the blessings of Agatha Christie’s family and estate. Descent of Man with Vijay Seshadri – Pulitzer Prize winning poet and has been an editor at The New Yorker, as well as an essayist and book reviewer in The New Yorker, The New York Times Book Review and various literary quarterlies. Child Star to Her Own Woman with Sarika – An acclaimed actor, she started her career at the age of four and has acted in films spanning diverse genres and chosen to go beyond into costume design, sound design and film production, winning critical acclaim and National Awards. 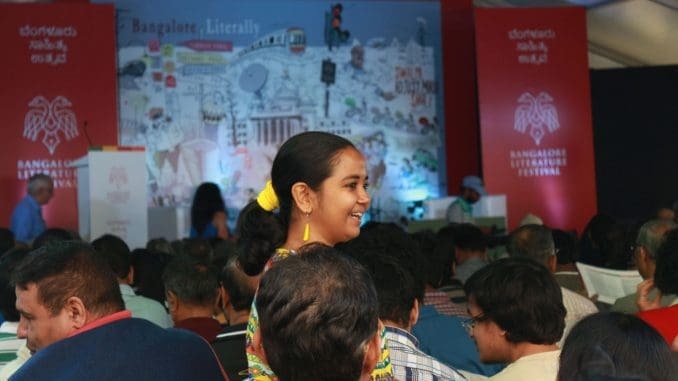 This year the Bangalore Literature Festival has doubled the children’s programming to include two forums – for children (4-10) and young adults (11-15) – on both days of the Festival and an exclusive bookstore for children. Titled ‘Children|Literature|Fun – C|L|F’ this includes writing workshops, RJ’ing, illustration, storytelling, creative games, magic shows all in a carnival atmosphere. Some of the exciting elements of C|L|F this year are sessions with authors including Anushka Ravishankar, Paro Anand, Aparna Jain, Poile Sengupta, Santhini Govindan, Stephen Alter, Anita Vachcharajani, Asha Nehemiah, Kartik Shanker, RJ Jimmy Xavier, music education sessions with Saskia Rao de Haas, Lithuanian illustrator and storyteller duo Evelina Daciūtė and Aušra Kiudulaitė, on being a stand-up comedian with Karthik and a whole host of other fun and exciting programming. Painstakingly curated by Vikram Sridhar, this promises to take not just children but the little kid in every adult too by storm. The Festival features stellar evening music performances – a sitar-cello duet with Pt. Shubhendra Rao and Saskia Rao de Haas and an all women band led by Saxophone Lavanya. The Bangalore Literature Festival and Atta Galatta, the city-based bookstore and art-literature space, will also give out the Atta Galatta–Bangalore Literature Festival Book Prize to honour the best of English and Kannada writing. There will also be a session in partnership with the The New India Foundation for the Kamaladevi Chattopadhyay NIF Book Prize for the best non-fiction book on modern / contemporary India. The Festival will be anchored by the city’s much-loved radio personalities Sriram Sullia and Darius Sunawala. The Literature Festival is brought to you by Friends of BLF – a group of eminent citizens of Bengaluru, who firmly believe that the city comes alive in its public spaces, in its arts and culture events that foster meaningful dialogue, enriching discussions and healthy debates; a group whose support has laid the foundation for an independent, community-funded literary event that the city can be proud of. Friends of BLF help create – with their generosity, energy and time – this world of words. The Festival opens at 10 am on October 27 and October 28. Entry is free, open to all and registration is recommended to get festival updates. For registration, complete schedule of events, participating author bios and other information check www.bangaloreliteraturefestival.org or follow #blrlitfest on Facebook, Twitter and Instagram. The Bangalore Literature Festival celebrates the creative spirit of Bengaluru and commemorates the literary diversity it offers, bringing it in conversation with the best minds in the world of literature. The 2018 edition of the Bangalore Literature Festival is a two-day literary extravaganza that will bring together some of the biggest names in literature – within and outside India. The objective of the Bangalore Literature Festival is to put together a literary experience that brings writers – both established and aspiring, readers, publishers, students and young professionals and other stakeholders of the city together on a common platform and create a compelling space for engaging and thought-provoking discussions on literature and life. The Bangalore Literature Festival is a non-profit run by eclectic pro bono team of Shinie Antony, V. Ravichandar, Srikrishna Ramamoorthy, Subodh Sankar, Vikram Sridhar, Shrabonti Bagchi, Sadhana Rao and supported by advisors and volunteers. This is a press note sent by Sridevi Rao, PRO for Bangalore Literature Festival (BLF), and published with minimal editing.